« What did the nut say to his buddies as he left the cocktail bar? 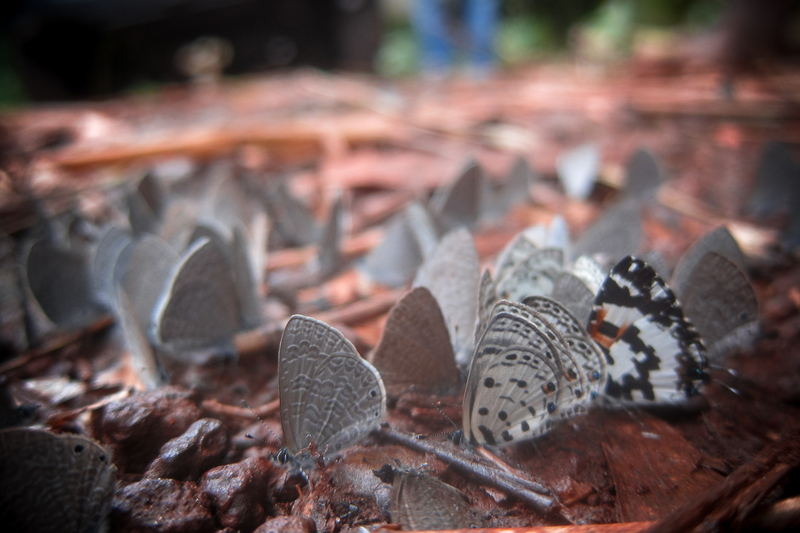 Butterflies, clustered by the hundreds on the red laterite road, fluttered up into the densely hot air like rebellious snowflakes as we rolled, bounced, and jolted west toward Grimari in a convoy of two Land Cruisers. White, with easily distinguishable red Médecins Sans Frontières (MSF) logos plastered on every surface, our vehicles are easily recognised by the local population; women smile and sing “merci!” in perfect unison as I wave from the passenger seat. Here in the Central African Republic (CAR), those who don’t speak French use the word “merci” to say “hello”. Hundreds of people raise both hands high, palms facing forward, to tell us we are welcome here. Usually, my jaw hurts from all the grinning I do during road movements like these, but today I have a more serious look on my face. I still wave, still make eye contact and nod my head or raise my eyebrows to greet people we pass, but it would be inappropriate to smile from ear to ear while a young man sits behind me, watching over the body of his dead brother. Shortly before 10:00 that Sunday morning I was sitting in the MSF office in Bambari, my stomach still feeling a little fragile after an uncomfortable Saturday spent making an above average number of visits to the latrine, when our project coordinator called on the satellite phone. The other logistician handed me a pen and I scribbled a message on a square yellow piece of paper: 27-year-old man; stab wound, left side; internal haemorrhaging; ETA Bambari hospital 13:00. One of our nurses went to the hospital, not far from our office, to give them the news so they could prepare to operate immediately on arrival. 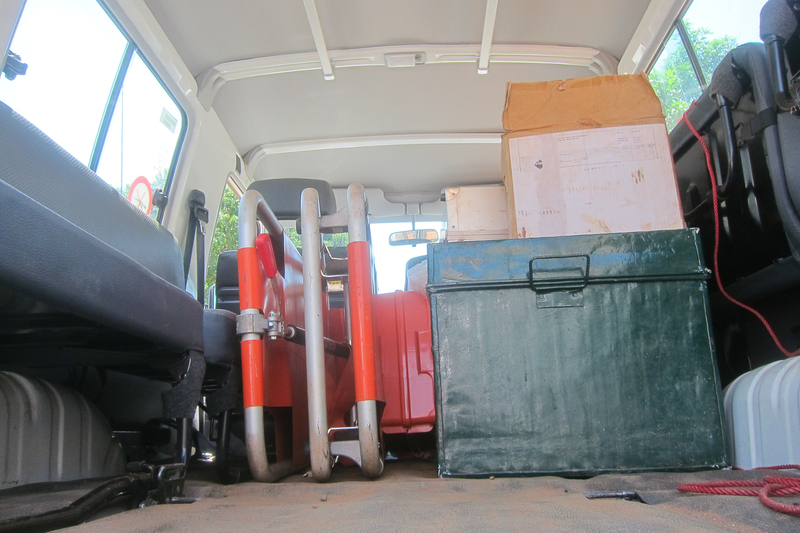 We loaded a stretcher and extra medical gear into a Land Cruiser and left Bambari with two vehicles. Our plan was to meet a Grimari vehicle halfway, what we call a “kiss” movement, move the patient into a Bambari vehicle, and send him onwards. Two vehicles would continue to Grimari, where I would be based for the coming two months. Soon enough, the other Land Cruiser came into view. It was parked on the road, opposite the small mud-brick Catholic church in a small village called Kongue. We pulled up alongside to make it easier to transfer the patient, but as I climbed down out of the vehicle, my eyes met those of our project coordinator, and I saw that it was too late. I asked, to be certain, and she confirmed that the patient had died a minute earlier. Villagers began to gather, and we asked them to leave some space so that a young man could grieve in peace. One teenaged boy in particular stood out from the crowd; the white string tied with a knot under his chin led up the sides of his face to a gaudy piece of fashion engineering: a tortoise shell – inadequately sized for his head – perched precariously on top of his cranium. Above the shell were layered a piece of aluminium foil and a handful of baubles. A string of evenly spaced magical charms sewn into small leather pouches formed his protective necklace. These accoutrements revealed his affiliation with the Anti-Balakas, the village self-defence militias found in many parts of CAR. He milled about like the other locals, concerned or curious – or perhaps both – by the three white faces standing on the middle of the road and the dark-skinned feet sticking out from under a sheet in the back of our Land Cruiser. I offered to be lead passenger in the vehicle carrying the deceased back to Grimari so that Mark, the American nurse who’d worked so hard to save the patient, could have some breathing room. An hour or so later, we stopped for a few minutes in Grimari, picked up two more family members, then began the drive to the deceased’s village. It took us an hour and a half to reach Ngbékota, a village 31km from Grimari on the road that leads to Sibut. 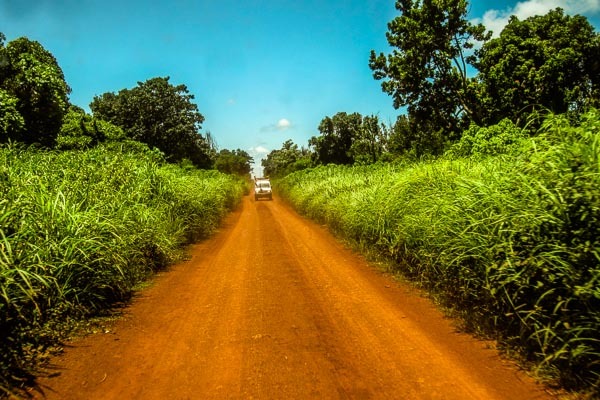 Pulling off to the side of the road, we reversed slowly under the shade of towering mango trees, and parked the Land Cruiser. The wailing began before the engine stopped, a chorus of women crying and screaming. While the family and friends mourned, someone approached the two MSF nurses. There’s a badly wounded infant, they said, can you have a look? We went together to meet the baby’s mother. As she unwrapped the cloth that covered her daughter’s wound, we were saddened to see what was underneath: an abscess covered the entire left buttock and more. It was a seeping, puss-filled, disgusting wound, covered and worsened by a brown mess of fibrous plant matter, the local treatment for open wounds. We wouldn’t be able to treat her adequately in Grimari, so we all agreed she should go immediately to Sibut, where the large hospital would be equipped to care for her. We asked to see the village chief, and when he arrived the two nurses spoke with him at length about cleaning wounds with soap and water and sending patients to a health centre before their condition worsens. I gave 22,000 francs CFA (about 33 Euros) to a local motorcycle taxi driver to carry the mother and infant to Sibut immediately, and gave 10,000 more to the mother to feed herself during her stay there. We drove off, hoping the child would not need to have her leg amputated. The only reason we found her was that her father was the young man who’d kept watch over his brother all day in the back of our Land Cruiser. A third of the way back to Grimari, we came across a pair of French military vehicles. A soldier weighed down by weapons, ammunition, gear, and protective equipment motioned us to stop. “We’ve found a body,” he told me – in French, but with a strong accent like most of his Foreign Legion companions – “are you able to take it?” I had known since morning that a body had been found 17km from Grimari, but the soldier said the victim was from Ngbékota, the village we’d just visited. We couldn’t return the body, I explained, as that would keep us out on the road past our curfew. “Nobody wants to take the body,” said the soldier. “He’s not from here and we don’t even know his name.” “Well,” I said, “if you’re not able to find someone to take possession of the body, and you can’t take the body back to Ngbékota, your best bet is to dig a hole somewhere nearby and bury him before the stench of his decomposing body becomes unbearable.” The legionnaire said he understood, and we drove on. 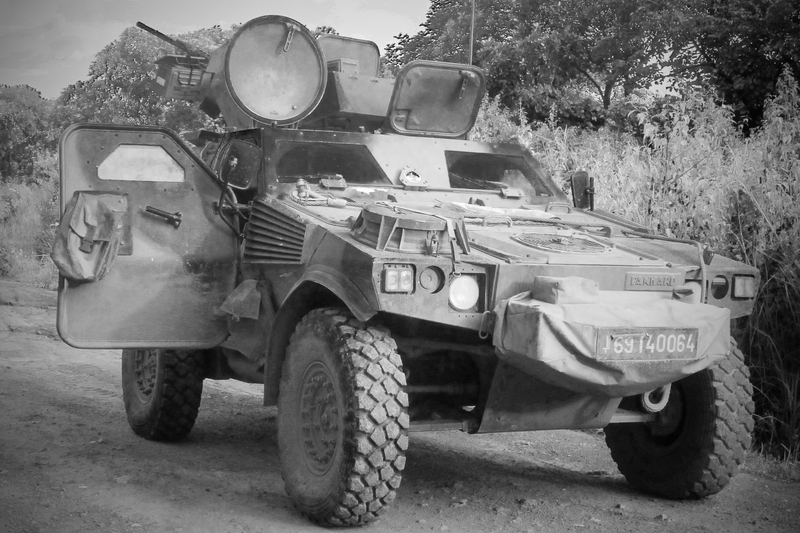 Within minutes we again found ourselves idling next to an armoured vehicle. For some reason, the French flag is always at half-mast on their vehicles in CAR. I jumped down from the Land Cruiser. The soldiers asked the same questions, got the same answers. One of them showed us the body, straddling a green bamboo pole passed through the wrists and ankles, which were bound together by vines. His eyes had been gouged out and his throat slit wide open, exposing marbled red and pink flesh and muscle, streaks of white ligaments, and yellow subcutaneous fat curds. The soldier dropped the small scrap of vinyl sheeting back over the body to keep the flies off. As we prepared to leave, repeating the advice to bury the body nearby, one of the young grunts came up to my passenger-side window and told me they couldn’t dig a hole because they hadn’t any tools. “You’re soldiers, but you don’t have shovels?” I asked, my eyebrows furrowing incredulously. “We broke them all back at camp,” came the reply. The putrid stench of his pitifully defeatist tone of voice, wafting toward me on a wind of inability and ignorance, was nauseating. I asked the driver to remove a shovel from the roof of the Land Cruiser, and gave it to the French soldiers to dig an unmarked grave. They promised to return it to our office in Grimari later that night. Visibly dejected, they thanked us as we drove off. The sun disappeared minutes after we arrived home; the Milky Way streaked through the darkness directly overhead; the rumbling of the town sputtered and died; the frogs and cicadas took up their instruments and began to play a symphony rehearsed every night but never perfectly performed. After a dinner of plain white rice, onions that smelled of fermenting tomatoes, and chicken as chewy as my steel-toed Australian leather boots, I took a cold bucket shower, lay my head down, and sweated myself to sleep. That was Sunday, the only official non-working day of my week. This entry was posted in Africa, Central African Republic, Humanitarian and tagged Bambari, Grimari, MSF, Ouaka.